The Apple Watch is set to arrive today for the lucky geeks who have pre-ordered the device. But obviously, a few favoured Apple evanglists have already gotten their hands on one. Beyoncé and Drake debuted theirs at Coachella, while Anna Wintour was spotted at a Burberry event with one. 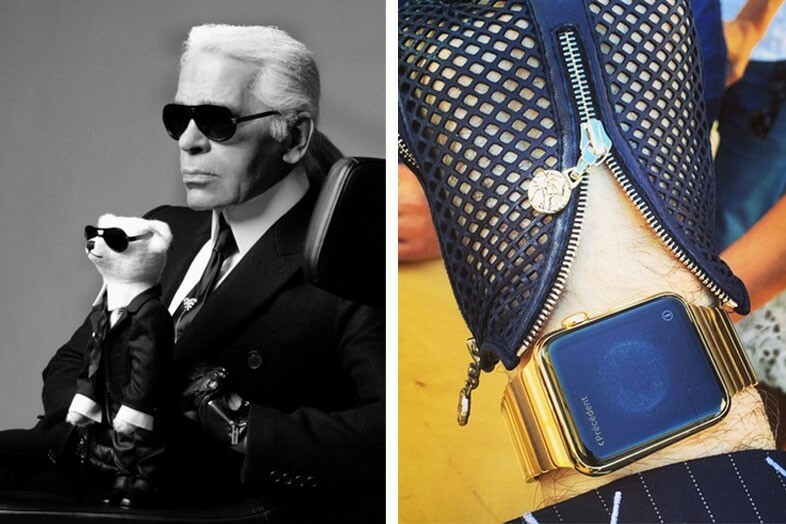 But there's one fashion legend who has laid claim to the title of first ever Apple Watch owner: Karl Lagerfeld. In a talk with Suzy Menkes at the Condé Nast International Luxury Conference, Lagerfeld showed off his watch, saying: "Look at how digital I am... I have the first one! I am very proud and very happy and Mr Ive [Apple designer Jony Ive] did very well to make sure I got it first." Apple created a customised version of the gold Apple Watch for the Chanel designer, estimated by MacRumours to cost around $25,000. His assistant and bodyguard Sebastian Jondeau enthusiastically instagrammed a picture of the timepiece, writing: "1st apple watch specially made for KarL !! Amazing !!! Thanks #apple !!!!!!" One caveat: Lagerfeld isn't entirely sure how it works. "I only got it a week ago," he admitted. But given that he's had seven days on everyone else, we're sure he'll be able to figure it out. Maybe Bey could help?